We know you have lots of questions about the Vancouver public deliberation event. To help you plan for your arrival in Vancouver, we have prepared a list of “Frequently Asked Questions” about the event. Please read through the questions and answers below. If there’s anything we’ve missed, let us know. Feel free to contact our study team members Colene Bentley or Lisa Scott by email at publicengage@bccrc.ca or by telephone at 604-675-8000, ext 7078 with any questions. We are here to help you! 1. What is expected of me as a participant? Participants are asked to attend all four days of the event and to participate in all sessions. No scientific background is required, and general information on the topic of funding for cancer programs and services will be provided. 2. If I miss the first weekend (April 13-14), can I come the second weekend (April 27-28)? No. If you miss the first weekend you will not be allowed to participate in the second weekend. 3. I can make if for 3 of the 4 days: can I still participate? Unfortunately not. We ask that participants be present for all four days. 4. Will food be provided at the event? Yes. Breakfast, lunch and snacks will be provided each Saturday and Sunday. Please let Lisa or Colene know if you have any dietary restrictions. 5. Participants will receive $125 per day to attend the event. When will I be paid? You will be paid at the event. 6. Where will the event take place? The event will be held at the offices of Allwest Reporting in downtown Vancouver (www.allwestbc.com). 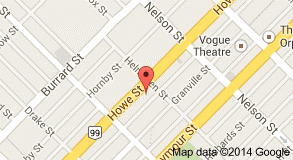 Allwest Reporting is located at 1125 Howe Street (at Helmcken Street), Vancouver, BC, V6Z 2K8. 7. I am coming to the event from outside the lower mainland. Where are the hotel accommodations? Reservations have been made for out-of-town participants at the Holiday Inn Vancouver Downtown (www.holidayinnvancouverdowntown.com). The Holiday Inn is located at 1110 Howe Street, Vancouver, and is right across the street from Allwest Reporting, which is where the deliberation takes place. Lisa Scott from the study team will make hotel reservations on behalf of out-of-town participants. event and give your name. You will also need to give the front desk your credit card for incidentals. 8. How do I book my accommodations at the Holiday Inn? Lisa Scott from the study team will book hotel reservations for participants from outside the lower mainland. Please contact Lisa directly at 604-675-8227 to arrange your hotel accommodations. If you are not from out-of-town and require hotel accommodations, please let Lisa know. These situations will be assessed on a case-by-case basis. 9. I will be driving to the event. Is there parking available? You will be reimbursed for the cost of parking and your mileage to and from the event. Please keep all receipts. 10. I will be traveling by ferry or airplane to the event. How do I make my travel arrangements? If you are traveling by ferry: Lisa will be in touch with those who are traveling to the event by ferry. You are welcome to make your own ferry reservations to Vancouver for the event—please keep Lisa informed about your reservations and send her a copy of the ferry booking. You will be reimbursed for the cost of the reservations and mileage if you travel by car from home to the ferry terminal and to the event. If you prefer that we make the reservations for you, Lisa will be happy to help you. Just let us know. If you are traveling by airplane: Lisa will be in touch with those who are traveling to the event by airplane. She will put you in touch with Oralee Hawley at Vision Travel to help arrange flights. When talking with Oralee, tell her you are with the “Vancouver Public Engagement” event. 11. How do I get to the hotel from the airport (YVR) or sea plane terminal (Coal Harbour)? Downtown Vancouver is connected to the airport (YVR) by a light rail rapid transit system called The Canada Line. Taxis are also available from the Vancouver airport (YVR) and the sea plane terminal at Coal Harbour to downtown Vancouver. From YVR airport: From the YVR-Airport station, take the Canada Line to Vancouver City Centre station (refer to the light rail map at the end of this document). Take the light rail train marked Waterfront station (Waterfront station is the end stop on the northbound Canada Line). From the Vancouver City Centre station, walk 1 block west to Howe Street. Howe Street is a one-way street going south. Walk south (the direction the cars are going) four blocks to Helmcken Street, which is where the Holiday Inn is located (1110 Howe Street). You can also take a taxi from Vancouver City Centre station to the Holiday Inn. From the sea plane terminal at Coal Harbour:From the sea plane terminal at Coal Harbour, walk to the Waterfront station and take the Canada line to Vancouver City Centre station. Taxi: Taxis are available to downtown Vancouver from the Vancouver airport (YVR) and the sea plane terminal at Coal Harbour. A one-way fare from YVR is $35-$40. You will be reimbursed for the cost of your transportation to the deliberation event. Please keep all original receipts. You will need them for reimbursement. 12. I will need to be reimbursed for my travel costs. How will I be reimbursed? Members of the study team will be at the event to complete expense claims forms for you. Please keep your original parking, taxi, and ferry receipts so you can be reimbursed. Expenses incurred outside of the event dates are not covered.